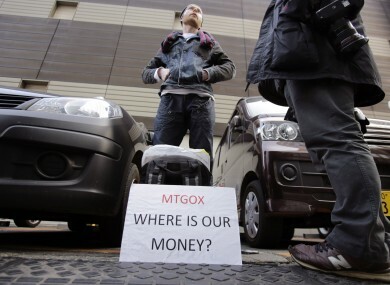 Back in February, one bitcoin trader Kolin Bruges stands in protest outside an office building housing MtGox in Tokyo. BITCOIN EXCHANGE MTGOX, which filed for bankruptcy protection in February after losing more than €368 million in bitcoin, has given up on its plans to rebuild the company. According to the Wall Street Journal, the exchange has asked a Tokyo court for permission to liquidate due to the complexity of rebuilding it. The difficulty of holding meetings with creditors spread around the world, as well as the lack of realistic rehabilitation plans for the exchange, added to the difficulty of getting MtGox back on its feet. For creditors in bankruptcy cases, a switch to liquidation usually means they will recoup less of their investment. One source said there was still hope a buyer for the exchange could be found, which could entitle creditors to a portion of future earnings. The court has yet to approve of MtGox’s request and if it does, a trustee will be appointed. who will take over management of the company’s assets from its CEO, Mark Karpelés. MtGox filed for bankrupcy back in February after losing more than 850,000 bitcoin, worth $425 million. Since then, it recovered 200,000 bitcoin, worth €87 million, in an old digital wallet which it then placed as part of the exchange’s assets. Email “MtGox abandons its plans to rebuild and files for liquidation”. Feedback on “MtGox abandons its plans to rebuild and files for liquidation”.